... of Portugal offers the fisherman a variety of good fish to catch out of the waters of the immense Atlantic Ocean. South of Lisbon there still is regular deep-sea Tuna fishing from the village of Sesimbra. This location was once famous for its offshore Swordfish but due to various influencing factors such a catch is now rare. 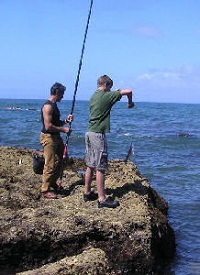 The main deep-sea fishing excursions are run from various locations along the Algarve coast. Depending on the currents and times of the year fishermen can catch SwordfishTuna and smaller Shark. Off the coast near Faroa blue marlin of more than 700 kilos was caught in 1983 and is still believed to be the Atlantic Ocean record. Inland there is the choice between many small and large constructed Dams or the various rivers. The latter are often subjected to pollution to a great extent. It is important to note that fresh-water fishermen officially require a license for their sport. This can be obtained from the National Institute of Forestry and its many local offices scattered through the country.